All are welcome to join the Massapequa Presbyterian Community Church for a Pancake Supper on Shrove Tuesday, February 17th. at 5:30pm in the Fellowship Hall. $7.00 per Adult, $3.00 for children in age from 3-10, and children under 3 year are free. 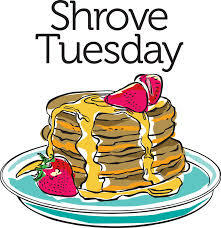 This entry was posted on February 2, 2015, in Upcoming Events and tagged congregation, faith, felllowship, pancakes, shrove tuesday. Bookmark the permalink.